With this handy guide, you'll be able to find the perfect wall mounting bracket for your TV, ensuring full compatibility while keeping all the features you need. 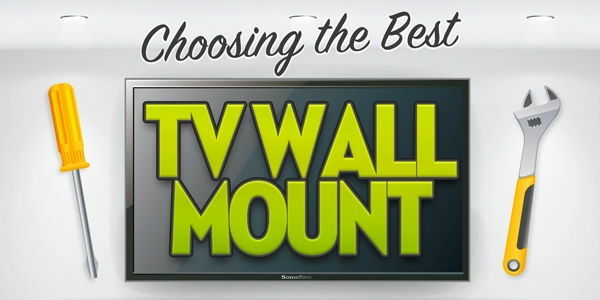 Our guide to selecting the correct television wall mount uses the specification standards unique to Cable Chick, but the same steps can be used when shopping at any retailer who carries quality TV brackets - just ensure they disclose all the critical specs and be sure to ask if any information is missing. It only takes one wrong measurement to turn a simple DIY job into a customer service headache! If you've already purchased your television, you can take measurements directly from the user guide or with a measuring tape. If you haven't made a purchase yet and intend to buy from a retail store, you can take your measurements from the demo models on display. If purchasing online, you may need to look up the manufacturer website for the full details. Big brands like Panasonic, Samsung, Sony and LG regularly make user guides available for download, too. That last one can be difficult to ascertain via information online. Many manufacturers don't list the bolt-hole spacing, or only link to their own brand of wall mount. If you can't find out the exact measurements for the mounting points on your intended TV, we have universal brackets that are flexible enough to remain compatible and cost effective. Commonly, screens compatible with the VESA Mounting Interface Standard will have that specification shown in shorthand, eg: VESA100, VESA400, etc. These are easily expanded back into actual dimensions (in millimetres) ie: VESA100 = 100mm x 100mm. This figure is helpful when checking to see if a universal bracket can be arranged to suit a VESA configuration. With very few exceptions, you can't hang all brackets on just any wall. Large TVs need large brackets, and these in turn need very good load-bearing structural support. For most timber-frame homes, this means a spot on the wall where two studs are available and no electrical wiring is in the way. Standard stud spacing on interior walls is 600mm, but 450mm is also common. Be sure to check that your intended wall has adequate support behind it to suit the width of the bracket. If this is shaping up to be a problem, there are some workarounds. One is to choose a different television or bracket which is compatible with your available stud(s). The other is to install a load-bearing panel or 'false wall' between studs to provide a secure anchor point at just the right place. Done professionally, this can add a lot of class to a room, too. It may even give you better options for mounting speakers alongside. Once you have a bracket in mind, it's a good idea to revisit this step to double-check it will definitely fit. It's a real let-down when you go to mount your TV only to find the wall isn't going to accept it safely. One of these options may immediately stand out as the best one for you. If you've already made your selection, you can skip ahead to Step 4! Each design has their own pros and cons, so if you're undecided about which bracket type suits all your needs, keep reading to learn about their strengths and weaknesses. Slim brackets keep the television close to the wall, which increases the strength of the assembly and keeps the panel out of the way as much as possible. For smaller TVs, some very low profile mounting systems can work directly on plasterboard without backing studs. The downfall of this space saving is limited cabling access. Ensure your intended TV has downwards- or sideways-facing power and AV sockets so that nothing will poke into the wall. Also consider the need for cable management accessories like right-angle HDMI adapters and wall plates to keep everything tidy. Brackets that boast an adjustable up/down tilt are the most popular, offering a flexible middle ground between low-profile and extending mounts. Generally you only need about 5 to 10 degrees of downwards pitch to prevent glare and offer maximum visual clarity. Tilting brackets allow you to mount your TV a little higher to keep it away from pets and children. Tilting brackets need more rear clearance to account for the movable arms. If adjusted incorrectly, there is potential for damaging walls should the mounting arms strike the plaster. Tilting brackets can work well for very large and heavy TVs, so timber, stud or masonry mounting is essential. Regularly described on Cable Chick as a 'Dual Pivot' mount, these large brackets offer total flexibility. With an extending wall mount, you can pull the TV out away from the wall, swivel it left and right, plus tilt it up and down. To save on cost, none of our brackets have gas-assisted armatures, so they rely on gravity and the weight of the panel to hold them steady. This makes them versatile and cost effective, but not all of them are suitable for the elderly or infirm. Extending brackets need enough cable slack and management to ensure that all power and AV connections will reach when at full stretch, and still be tidy when retracted. Due to cantilever flex, extending brackets can sag a little when extended, and require a very secure mounting point. DIY is not recommended for inexperienced installers. Simply skip over any irrelevant matches by looking at their product photo. Weight Rating - Check that your TV doesn't exceed the weight rating of the bracket. If you're looking at extending mounts it's always good to be over cautious with this rating - an extra 10 or 15 kilograms of safety margin is a good idea. With modern flat panel TVs being very light, you might find that this initial check doesn't narrow the field too much. We'll fix that up in the next step. Dimensions - If your TV's overall width and height measurements are larger than the bracket, your TV will hide the mount for a tidy installation. Choosing a bracket that is too large can leave the mounting arms poking out top and bottom. This can be a safety hazard, as well as limit the range of tilting features. Choosing one that is too small can put tremendous pressure on any articulating parts. It's best to check our recommendation on screen sizes here, too. Bolt Hole Spacing - For Universal brackets, ensure the measurements given on the product page are greater than the measurements on your TV's mounting points. A little bit of extra room might even allow for upgrading to a larger screen in the future. For VESA brackets, a match between VESA standards is recommended where possible, but we do have an extra section below on adapter plates which can expand the compatibility of many VESA brackets. Don't forget: many of our universal brackets are also compatible up to VESA400 (400x400mm) so these may be additional candidates for your selection, provided they meet your other requirements and size/weight ratings. Rear Clearance - This is the measurement between the wall and the back of the television, or the depth of the bracket. Make sure the bracket leaves enough space for the cabling you intend to attach, plus any wall plates or power points. Extension & Rotation - If purchasing a Dual Pivot Extending Bracket, check that it has the reach to suit your needs. Many extending brackets are configured to swivel left and right from a central point at the back of the TV, but large brackets with dual arms may sacrifice some left/right motion for stability. Every TV is different, so it can be difficult to know exactly what angle an extending bracket can achieve before the edge of the TV touches the wall. While a bracket may state it has 180 degrees of motion left and right, this figure does not factor in the TV. Cable Chick strongly recommends that all Mounts & Brackets be installed by a qualified professional. Our brackets are made tough, so in most cases the weakest point will be the fastening to the wall. If you are in any doubt about installing a wall, ceiling or desk mount, please consult a professional tradesperson. TVs can also be difficult to manage due to their size, with many modern panels over 40" requiring at least two people to move them safely. As a retailer, Cable Chick is only responsible for the product and the parts provided with it, so it's best to avoid taking risks which might lead to damage of your wall, TV or bracket which aren't covered by warranty. During the process above, you may have found a VESA wall mount that's perfect in every way except that it doesn't match the same VESA standard as your TV. In many cases, you can use one of our VESA Adapter plates to upgrade a smaller bracket to suit a larger Television. Care must be taken to ensure that the weight rating in particular is not exceeded, as a larger screen at the end of a small extension arm puts a lot of cantilever force on the mounting point at the wall. You can use an adapter plate with extra spacers to make a large bracket suit a smaller screen, but a reduction like this can look very untidy. Once you've run through the steps above, you should have narrowed your choices down to one or two options. Purchasing a TV mounting bracket on CableChick.com.au is easy, and you don't want to have to pay postage to exchange a big heavy bracket that isn't suitable! Double check everything before you hit the buy button! If you're planning to do the installation yourself, check to ensure that you have a spirit level if you need one. You can also make your own drilling templates using cardboard cut to the size of your TV - this can help you decide on placement before you make holes, too. Sometimes it's easier to just ask for help with things like this. If our guide hasn't made selecting a bracket any easier, please fill out the form on our Contact page and include the make/model of your TV where possible.